Discovery Channel is broadcasting documentary ‘Earthquake: Disaster in Nepal’ on April 25 devastating earthquake that claimed lives of over 8,000 people.The documentary will be aired at 9:15 pm NST on June 8, according to Discovery India. 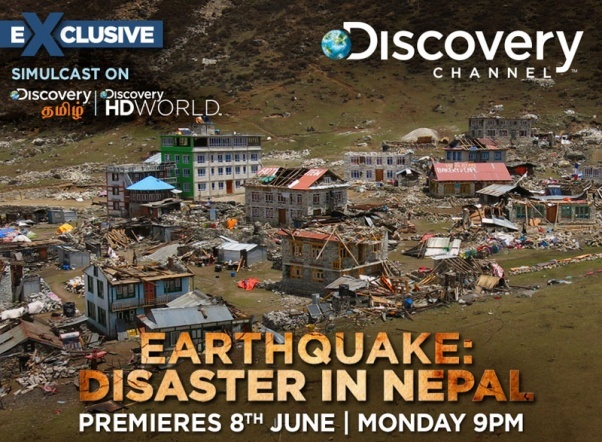 The channel said the documentary will feature expert interviews and seismic simulations to explain the science behind the earthquakes, footage of the rescue operations in Kathmandu, news reports from around the globe and exclusive glimpses of new technology and research being developed to help humanity better predict and cope with natural events such as earthquakes. The program will also feature first-hand accounts from those who survived the natural disaster, from a mother whose baby was buried for 22 hours and a student who was crushed under a multi-story building in the city’s Durbar Square, to a newlywed couple caught up in the avalanche at Everest’s Base Camp 1.